Have you considered replacing your stair treads? Most people never give the idea a thought. But, they really should. Although stair treads are often overlooked, simply changing them out for new ones can have a profound effect on both the stairway and the inhabitants of the house. If it has been a while since you’ve thought about the stairs in your home, take a look at some great reasons why you should consider replacing your stair treads. One of the most important reasons for having stair treads is to keep your family safe. Too often careless kids and unsuspecting adults easily tumble on stairs that are not safe. Stairs can be a dangerous place. Kids are constantly running up and down them without a care in the world. The problem with this is that it is far too easy for the kids to slip and fall, especially if they are not wearing shoes and the treads are not secure. But, having a sturdy stair tread in place is all it takes to keep the kids from stumbling and falling head first down an entire flight of wooden stairs. Kids are not the only ones susceptible to a fall. Adults can easily misstep, even when they are being careful. But, even a slip down one or two steps can result in a nasty ankle sprain that takes months to heal. Replacing your old and worn out stair treads can also help save adults who can inadvertently miss a stair as they are going from one floor to the other. Functionality is not the only consideration with stair treads. Sometimes they provide an aesthetic boost to a home. Replacing aging stair treads on an old and worn out stairway can give it an instant face-lift. Stairways get a lot of use, and therefore they can become worn quite quickly. Rather than refinishing the stairway, which would put it out of commission for several days, put down stair treads. When you have new stair treads, all of the old scuffs, faded spots, and ground-in dirt will be gone. Using stair treads is a great way to add a little variety to your home. Gone are the days when you only had a few choices for your stair treads. These days, stair treads come in a variety of wood grains and are also made from a variety of wood species. So, if you have had the same stair treads since you moved into your house, a change might just be what the doctor ordered. 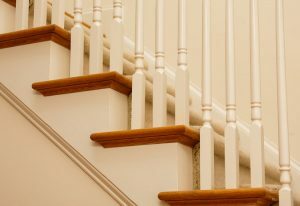 Replacing your stair treads can also provide an inexpensive and easy way to modernize your home. When you have had the same stair treads for 15 or 20 years (or longer), they can begin to make your home look dated. If you do not want to have a house that obviously shows the decade in which it was built, swapping out your stair treads is a great way to give your home a more current look. If you are planning to sell your home, it might be a good idea to replace your stair treads. This one simple act can improve the overall appearance of your home and make it more desirable to prospective home buyers. Further, houses that are more desirable get sold for more money. So, not only will people be more interested in buying your home, but you can set a higher asking price as well. So, you can easily recoup the money you spent on the improvement in your sale cost. Stairways perform an important function in a home. Whether they are leading up to additional floors or going down into a basement, stair treads need to be strong and durable to do their job properly. 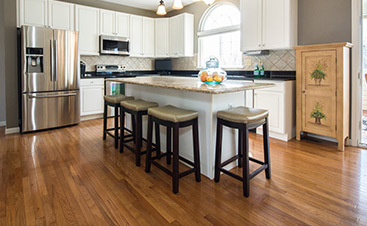 Over time, stair treads can begin to pull away from their bases and become unstable. The result is a creaky and squeaky stairway. Although this problem is not the worst one in the world, it can become quite annoying for those who live in the home. Replacing loose and noisy stairs with new treads can make the stairway quieter, which will calm the nerves of everyone who lives in the home. Stairs get lots of use and abuse every day. After a while, they can begin to weaken. If you are not watchful of weak steps, someone can easily damage them with just one step. Replacing stair treads before they lose their durability can save you from having an injured family member or guest who was using the stairway or from having a huge repair bill from having to repair the entire stairway. 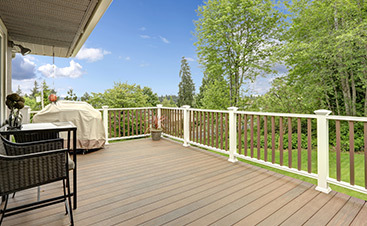 If you are ready to replace your stair treads, a professional can help you. 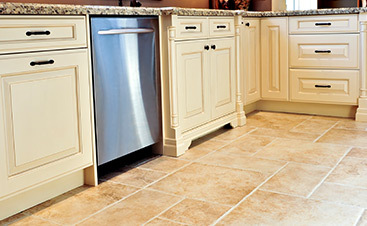 Contact one of our expert staff members today to discuss how we can help you transform your home.